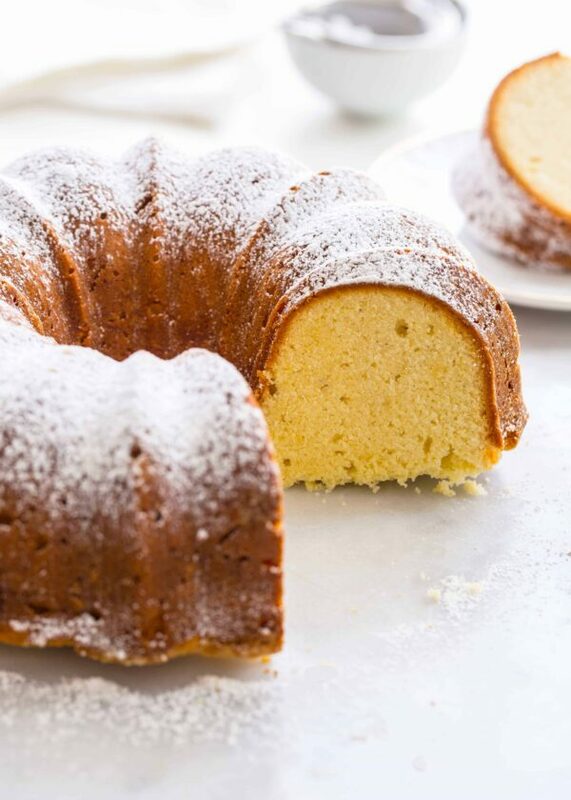 Cream Cheese Pound Cake is one delicious way to treat yourself to dessert. Whip it up all summer long! Pound cake. For some reason, every single time I think of pound cake I think of little old grandmas and Sarah Lee. Why? I have no idea, it’s just a thing. I also don’t make a lot of pound cake. Not that I have anything against it, it just seems kinda mundane to me next to the best chocolate cake and No Bake S’mores Cheesecake. If your thoughts on pound cake are at all similar to what mine were, allow me to change your mind. This Cream Cheese Pound Cake will open up a brand new world of pound cake consideration and will literally have you secretly escaping to the kitchen to nibble on it. A magical crust develops on the top of this cake that’s so incredible, I seriously wanted to the slice the top off (well, actually the bottom once you flip it) and keep it all to myself. 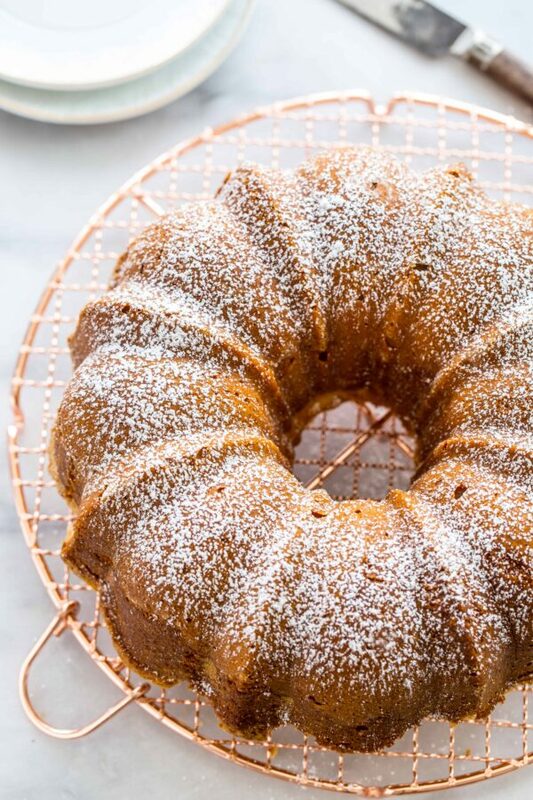 Pound cake is one of those things that’s perfect for toting along to outdoor parties. It doesn’t need refrigeration on its own, it pairs exceptionally well with fruit or fruit sauces, and it travels easily. It’s just not one of those desserts that needs you to be finicky with it. Which is kind of awesome. It’s really perfect for summer barbecues and even better if you toss it on the grill for a few minutes and serve with fresh summer fruit like raspberries or grilled pineapple. If you’ve never tried grilled pound cake, you’ve really got to try it with this recipe. You know how garlic bread gets ten times more awesome when you throw it on the grill? Pound cake does the same darn thing. 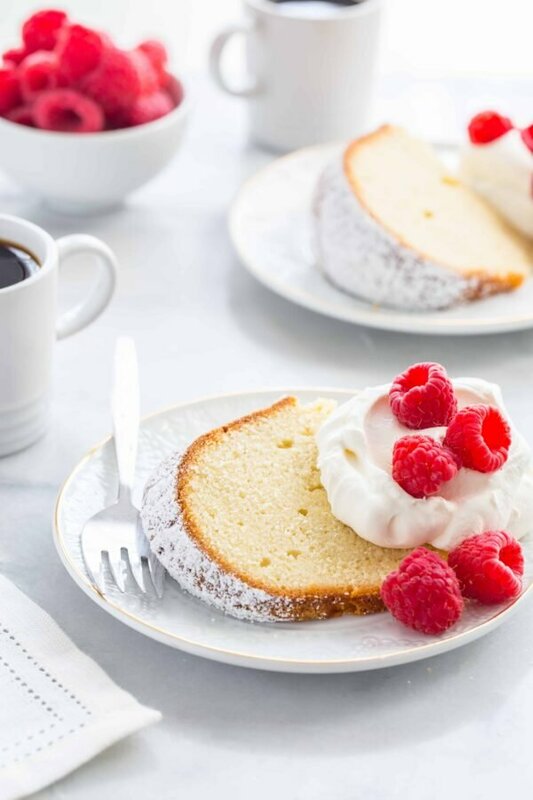 All said and done, I opted to plate it up with fresh whipped cream and raspberries, but it’s also incredible with Grand Marnier soaked strawberries. Any way you serve it, I’m betting it will be hit! My version of this cake is strongly lemon – the recipe calls for the zest of four lemons. But feel free to try lime zest or even orange zest. They’d both be fantastic in this cake, and pair well with the simple topping of whipped cream too. For more delicious summer recipes, be sure to try these Raspberry Lemonade Cupcakes and this Homemade Hot Fudge Sauce. 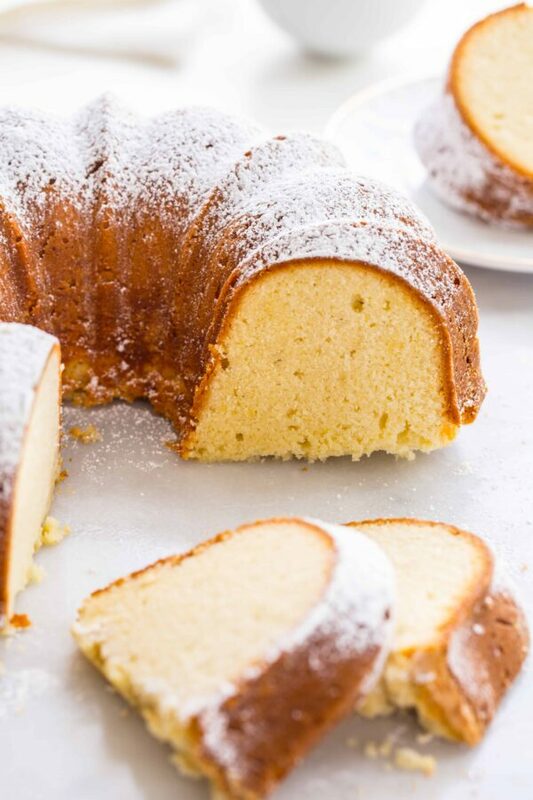 This post for Cream Cheese Pound Cake was originally posted in June of 2011. Photos and text have been updated. Preheat oven to 325°F. Grease and flour a 10 inch bundt pan. In the bowl of a stand mixer, fitted with the paddle attachment, or with a hand mixer in a large bowl, cream the butter and cream cheese until smooth. In a medium bowl, combine the sugar and lemon zest and mix together with your fingertips until the sugar is moistened and fragrant. Add the sugar mixture gradually to the butter and beat on medium speed until light fluffy, about 3 minutes. Add eggs two at a time, beating well with each addition. Add the flour all at once and mix in. Add vanilla and mix thoroughly. Pour into prepared pan. Bake at 325°F for 1 hour and 20 minutes. Check for doneness at 1 hour. A toothpick inserted into center of cake will come out clean. Strangely enough, I’m making it for a Christmas dessert. I have frozen strawberries and real whipped cream. After a heavy meal, light dessert is just the ticket. 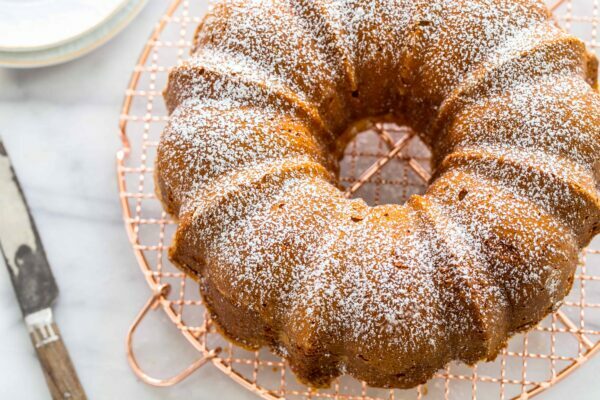 And this pound cake looks scrumptious. It’s been in the oven 70 minutes at 325 and I think it’s done. I hope you enjoyed it, Pam! Love cream cheese pound, but you haven’t lived until you had it with cream frosting! Sounds wonderful, Jan! I’ll have to try it! Hi, it’s really an easy recipe to do. But can you write the ingredients in grams please? like butter and cream cheese. Thanks. Hi, Amna! This converter should help out. I hope you like the pound cake! So happy to hear you enjoyed the recipe, Mariann. Thanks so much for stopping by and leaving your feedback! Happy Baking! Made this cake last weekend and served it with vanilla bean ice cream and strawberry coulis. So delicious – no leftovers! So glad to hear you enjoyed it, Mimi! Your cake looks delish! Thanks for the awesome recipe!! I almost cried a little….I made this and it reminded me of the one my GG used to make…..fantastic!!! So happy to hear you enjoyed the recipe, Tiffiany. And that it bough back great memories! Just looking over the picture makes me to eat it but controlling my temptation for the cake, I decided to make this cake for a small get together and the cake turned out to be the star of the show. People loved so much that they want it more. It was a simple recipe. Cake was perfectly moist and had amazing taste. Thank you for sharing the recipe. Thanks so much for stopping by and leaving your feedback. So glad to hear you enjoyed the recipe! I think you could cut back on the sugar a bit and be just fine. So glad to hear to liked it! You are correct, Dawn. No baking powder. Happy Baking! Can I use a normal round or square cake pan instead? Hello! You can definitely use a different pan, you will just need to adjust the baking time accordingly. I haven’t tried this cake in either of the pan sizes you mentioned, so I am not sure how to guide you regarding the baking time. Thanks so much! 1. Last time I reduced Sugar by 1 cup. The taste was great and so the cosistency. However, i had glowy greasy line in the cake. I did overbeaten the batter before and after adding the flour. Do you think this is the reason or it is the Sugar amount. 2. I would like to try it this time with raisin. Have you tried it before? Do you think it would work or would they sink to the bottom of the cake? Any advice? Thanks Alot for the great recipe!! So happy to hear you enjoyed the recipe! Changing the amount of sugar, especially by that amount, will definite have an effect on the final recipe, so I would imagine that may have been the issue. I have never made it with that much sugar left out, though, so I can’t say for sure. I have not tried adding raisins, but I think you should give it a try. A trick to keeping dried fruits, etc, from all sinking to the bottom of cakes, breads, etc, is to take 1-2 tablespoons of the flour and stir it up with the fruit you’d like to add. Then fold in the fruit before baking. Hope this helps! Happy baking. Thanks Jamie for your reply! How much sugar do you think I can safely leave out without affecting the recipe? Hello – Without having done it myself, I unfortunately can’t say for sure. If you try it again, I’d love to know how it turns out. Happy baking!